Complaining about L.A.’s traffic is about as tired as, well, complaining about L.A.’s traffic. I’m aware. Regardless, last week I found myself on multiple occasions making the east-west commute. For those of you unfamiliar with the layout of Los Angeles, the trek is—at its best—45 minutes up to an hour and a half (and we’re only talking about 10-15 miles here). Alas, Babylon. The bright side: It was an opportunity to genuinely listen to a lot of new music including the upcoming Strut Records release Next Stop Soweto :: Volume 1. The collection fortuitously landed in my mailbox at the perfect time, as I’ve been wearing out the 1986 Soweto Never Sleeps (thanks, Paul) collection for months now. (Side note: if this stuff is your bag, Soweto Never Sleeps, while out-of-print, is very much worth tracking down, as is the seminal, easily obtainable, The Indestructible Beat of Soweto :: Volume One). Next Stop Soweto is the first volume in a three-part series exploring late ‘60s and ‘70s underground South African music. 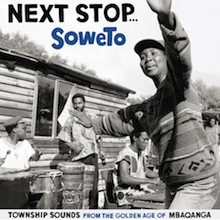 The first volume, Township Sounds, focuses on the township jive sound, Volumes 2 and 3, released across Spring and Summer 2010, cover rare South African soul, funk, Hammond R&B and choice sides from the country’s jazz scene. While derived from an incredibly economically depressed region, a strain of poverty this Western mind can hardly fathom, the music captured within these sets is paradoxically joyous—the sounds of life distilled to its purest form. And while driving through L.A. with this coming through the speakers, in a city of have and have-nots, the similarities/juxtaposition are anything but lost.